Turkish police have arrested the sons of three cabinet ministers as part of an investigation into alleged bribery relating to public tenders. The sons of the interior minister, the economy minister and the environment minister were detained, officials say. Businessmen are among at least 20 people arrested in dawn raids in Istanbul and the capital, Ankara. 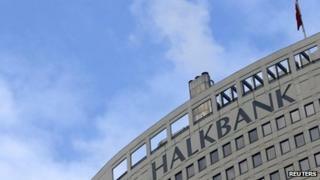 In a wide-ranging investigation, police raided the Ankara headquarters of one of Turkey's biggest banks, state-run lender Halkbank. A senior official at the bank has reportedly been arrested. Many believe the arrests are evidence of an increasingly public argument between supporters of Prime Minister Recep Tayyip Erdogan and members of an influential social and cultural movement led by the self-exiled Islamic scholar Fethullah Gulen. Over the last decade, these two camps united to win three general elections for Mr Erdogan's ruling AK Party. But in recent months, their alliance has begun to come apart. In November, the government discussed closing down private schools, including those run by Mr Gulen's movement, Hizmet. In return, commentators suggest Gulen supporters in the police and the judiciary orchestrated the dawn raids against Mr Erdogan's allies in Istanbul and Ankara. The argument reveals a new fault-line in Turkish politics - one within the governing AK Party. The prime minister survived opposition protests in June with little immediate trouble. But the greater threat to Mr Erdogan's ambition to stay in power may now come from within. Halkbank's shares fell by as much as 5% when the news emerged, but have since recovered, up nearly 2% in morning trading. Also raided was the headquarters of a large construction company owned by construction tycoon Ali Agaoglu. Its chief executive, Hasan Rahvali, told the Reuters news agency the investigation related to "claims of bribery against some public officials", but police "could not find any criminal evidence". The sons of Interior Minister Muammer Guler, Economy Minister Zafer Caglayan and Environment Minister Erdogan Bayraktar were arrested in Istanbul. Turkish political analysts are speculating that the arrests may be linked to a disagreement between Prime Minister Recep Tayyip Erdogan's government, with its roots in political Islam, and prominent cleric Fethullah Gulen. Mr Gulen objects to government plans to abolish private schools, many of them run by his Hizmet, or "Service", movement. Despite living in the US, Mr Gulen is believed to enjoy extensive influence within the Turkish political scene. Mr Erdogan's government has vowed to deal with Turkey's deep-rooted corruption. The dispute and the raids come as Turkey prepares for local elections next year. They are being seen as a test of Mr Erdogan's popularity after protests earlier this year against what many saw as his authoritarian style.